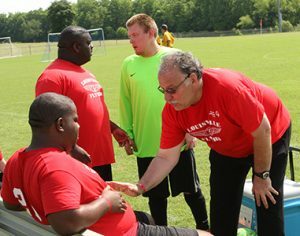 Athlete Training is an integral part of the Special Olympics program! One of the founding principles of the Special Olympics movement states that “People with intellectual disabilities can, with proper instruction and encouragement, enjoy, learn and benefit from participation in individual and team sports. Consistent training under the guidance of qualified coaches, with emphasis on physical conditioning, is essential to the development of sports skills”. Sample training sessions are available for all sports through the Special Olympics Sports Skills Guides. A Sports Skills Guide can be obtained by calling the SOKY Office, 1-800-633-7403 or by e-mail.